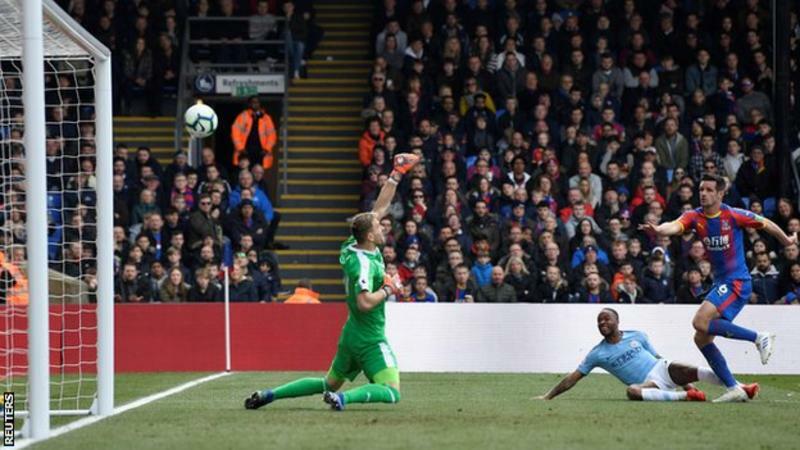 England winger Sterling’s instinctive finish after Leroy Sane’s pass doubled the lead before Palace, who are 11 points above the relegation zone, reduced the deficit through Luka Milivojevic’s late free-kick. Substitute Gabriel Jesus extended City’s lead with a smart finish – City’s 150th goal in all competitions this season – to leave his team one point clear of Liverpool with five games remaining in a fascinating title race. Having looked ordinary edging past Brighton in the FA Cup semi-final last weekend before losing in the Champions League at Tottenham on Tuesday, Guardiola’s side returned to their majestic best in south London. Guaita produced a palm-stinging save to keep out Sane while Palace’s Spanish keeper had to make a smart stop to prevent Martin Kelly scoring an own goal before Sterling made it 2-0, finishing off a lovely move that involved David Silva and Sane. With Jesus’ late strike giving the score a more reflective look, City will head into Wednesday’s Champions League quarter-final second leg in confident mood as they look to overturn a one-goal deficit.